Dragon Age II Collector's Edition: The Complete Official Guide is the latest in the line of collector items been released this month. This edition is a hard cover version of Cassandra book based on the game of the same name. As with all collector's items, this book comes with lots of never-seen before behind the scene images, graphics, photo gallery and additional 16-page of high quality content for those die hard fans. I took a sneak peak at it because, as a technical review, you get to see these books before they hit the shelves. 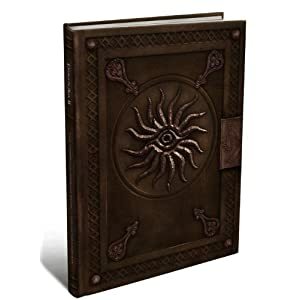 And I must tell you the Dragon Age II Collector's Edition: The Complete Official Guide is not only a nice book on the Dragon Age game , but a massive collector's item. As if the book isn't enough, Electronic Arts are releasing the next generation of the game to coincide with the release of the book. For me, as an avid gamer, I think this is Christmas come very early. Why couldn't they at lease wait till the middle of the year before they push these products into the market? My theory is that by doing it now, it gives them the ample opportunity to create buzz and awareness for the Dragon Age II Collector's Edition: The Complete Official Guide well ahead of others before Christmas - giving them enough time to shift their product. However, this book is written that it seamlessly add greater value to the game. Every care was taken to ensure that there are no spoiler for those who like to have a go at the games first. It is like a journey further into the game; each chapter discussed the strategy and in-depth analysis of the game. If you are a fan of the Dragon Age 2 game, there's a lot in the book that will make it worth your while. These include, the plots, strategies, tunes, weapons, enemy locations, special effect discussions and lots more.